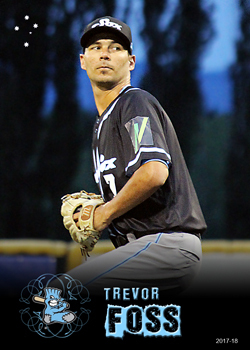 Foss is an American import who is playing with the Sydney Blue Sox during the 2017-18 ABL season, his second in the ABL. Foss had previously spent 4 years between 2013 and 2016 playing in the Minors with the LA Angels and Cleveland Indians before spending 2016 and 2017 playing for the Washington WildThings in the independent Frontier League. As my first card featuring a 2017-18 image you can see that the Blue Sox seem to have moved away from their powder blue away tops and are now playing in a black top with the white and blue trim.